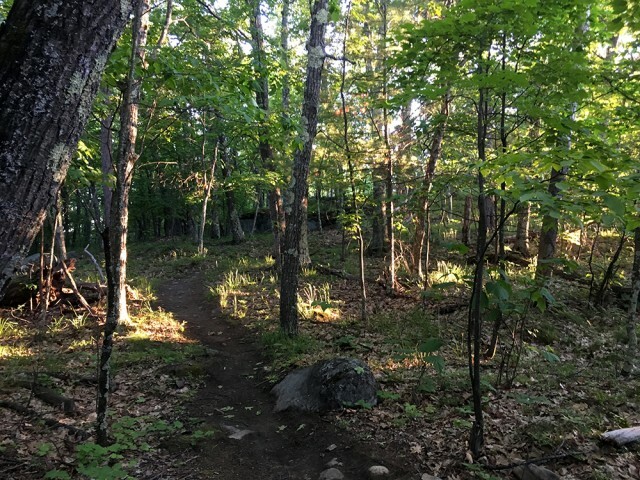 This year, my main focus has been on training for the grueling uphills that are completely unavoidable on most of the mountain bike trail systems in the Adirondack Mountains. I always find myself asking why I have such a hard time getting up those hills when I seem to be in fantastic shape because of how often I bike. 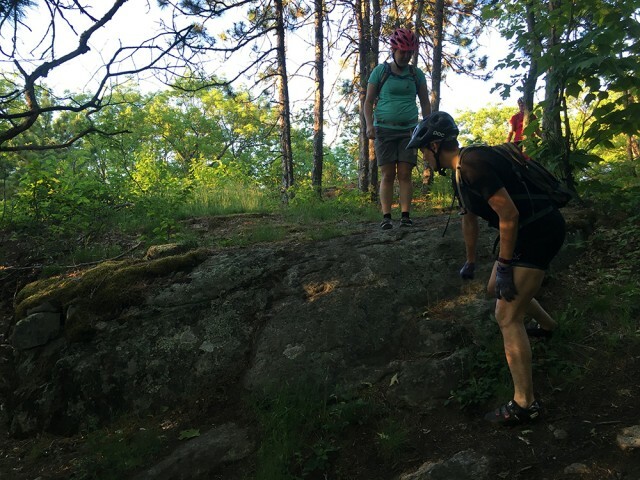 Turns out, if you want those mountain biker legs you really have to bike up, and up some more — and some more up — and up until you think you're at the top, and then keep going up because you definitely have another mile of up. Then you realize that you really need to repeat this process about once every day. Not really, but that’s basically how I fell back into the riding season this summer. I started off with a full plate of “up” served by the Hardy Road Trails. For some reason, all my friends decided this was the place to go for about two weeks straight to get rid of their winter cabin-fever highs. Of course, these trails are always the first to dry out. 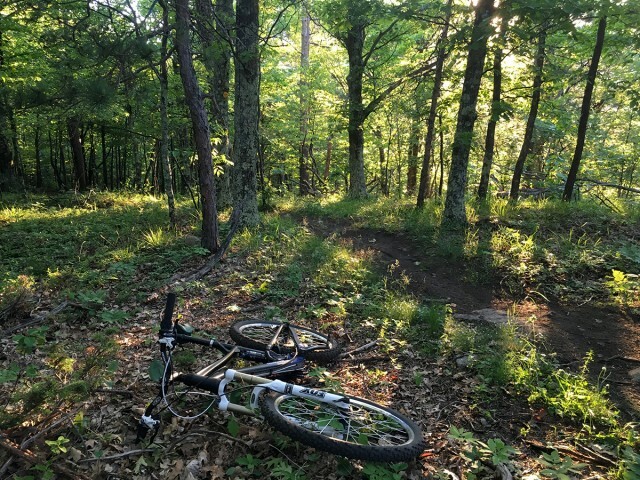 Don’t get me wrong — even though these trails provide a lot of uphill riding that can get pretty tiring, they still remain my favorite trail system to ride. Each foot is worth the climb. 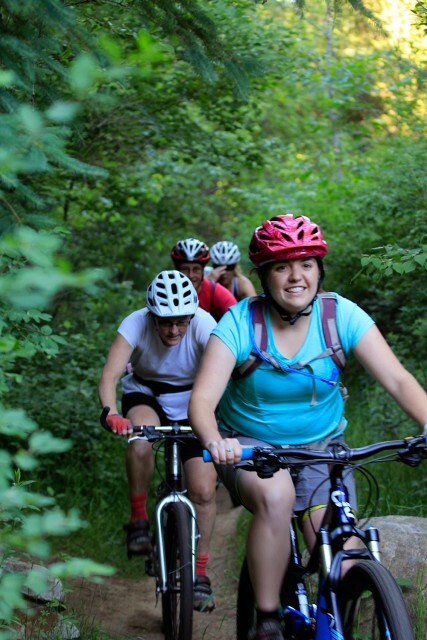 The Hardy Road Trails offer a great variety of flow, technical areas, and lots of uphill complemented by lots of downhill. The first few days this summer were a bit rough as I tried to power up the mountain. After riding it for the fourth time in one week, I was starting to feel a bit stronger. Typically I arrive at the trail head in the evening, giving me about two-and-a-half hours of daylight. A lot of the locals tend to show up then, when the day is just beginning to cool down. 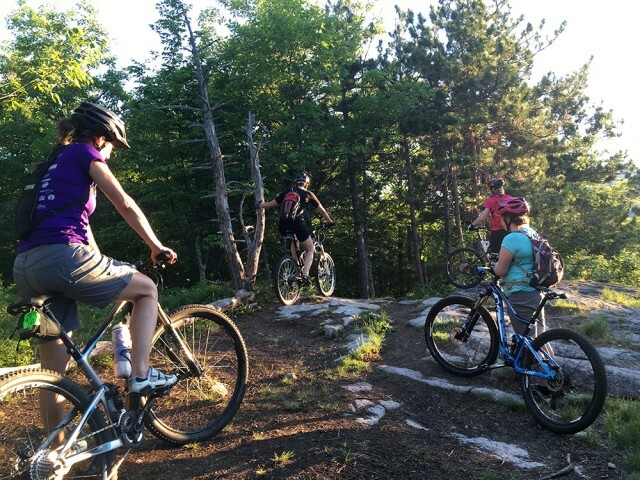 To get a warm-up lap in as well as a feel for the bike and the trail conditions for the evening, the trail Coniferous is a great place to start. This is about the easiest trail offered at Hardy Road. It’s fairly flat compared to the rest of the system, even as it winds through many slithering s-turns. 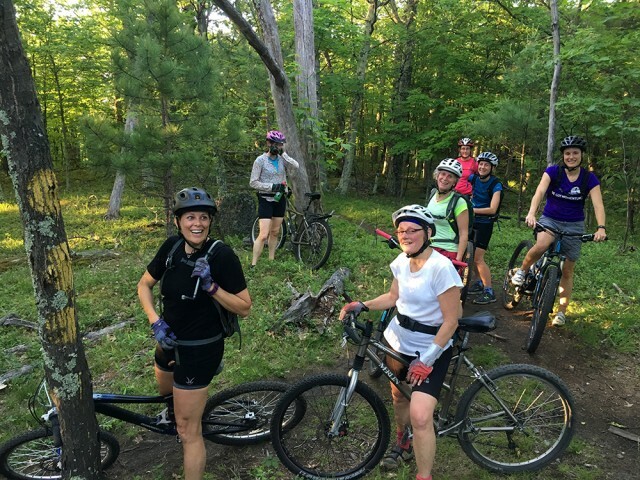 There are a few roots on this trail, but it's still very beginner friendly. Tackling this in either direction is just as fun. To get my legs under me before I take on the big climb for the day on the trail All-In, I head back to the parking lot and cross the road, taking an immediate right to the trail Make Believe. This trail winds its way through the red pines and begins to work its way up a hill to the trail Twisted Pine. I'm still warming up by this point, so I like to take a rest where these two trails meet. Once at the top of Twisted Pine, it’s all downhill back to the parking lot. This section is one of my favorites at the Hardy Road Trails. It is smooth flowing for the most part, but there a few roots and some nice S-turns accompanied by some nice berms. The forest is very pretty on this part of the trail as it turns back into tall red pines, leaving the forest floor pretty open. If I don’t feel like my legs are quite warmed up, or if I have a lot more time to spare, I’ll take one more lap up Make Believe over to Twisted Pine. Once back at the parking lot I usually feel ready to head up All-in. All-in is about a 45-minute climb up for me and I typically stop for a break about three times or so. 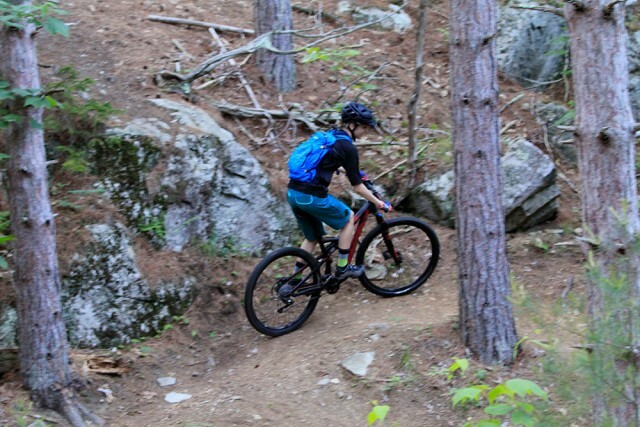 It is full of switchbacks and tight turns, and it definitely has its fair share of large rocks and roots that prove a little tricky to get up and over on the climb, especially if you’re not used to it. On the way up you will also notice a bunch of drops off of boulders to the sides of the trails. I’m not quite ready to hit those on the way down yet. Maybe by the end of the summer I’ll have enough confidence to try one of the smaller ones out. My legs are always burning in the first few switchbacks. I’m usually peddling in the easiest gear possible the whole way up. I just tell myself “keep going, it’s only making me stronger” or remind myself that each foot I climb is one more foot of downhill riding I can enjoy. At the junction, about midway up, I like to take a break and grab some water. From here you can continue up either way, because the trail makes a loop to the top. I tend to enjoy continuing on straight ahead at the junction instead of turning right. I like going up this way because it's a little less steep and it takes you up along a ridge to the top. I feel that the other direction is the best way to bike down the mountain. Right before you get to the top of the ridge there are two sections of the trail where it begins to get a lot steeper than the rest. I used to not be able to make it up these, but after all the rides at the beginning of my season, I’m starting to power right up these climbs. Once on the ridge you work your way over to a little clearing. This is a great spot to take a rest, chat with your riding buddies, and grab a snack to eat. Although there’s not much of a view from the top, you can sometimes manage to see Whiteface Mountain off in the distance, especially when all of the leaves are off the trees. From here it’s all downhill. Your legs will have gotten a wonderful workout, and now it's time to descend and practice your gravity skills. I always tell my friends who are new to riding that anyone can ride down as long as you go at a pace that’s comfortable for you. If you need to walk your bike that’s perfectly OK! I can promise you that it’s worth every foot you climbed. Right at the beginning is a boulder that looks very intimidating, but surprisingly you can roll right over it. I usually go around it but this year I’ve become a more confident rider. Cruising down the trail, there are many rocks and roots that seem to jut out at you. In my experience, it’s a lot easier to remain in control if you hit them with speed. Your bike can handle it and my friends and I always say that speed is your friend. Once down to the junction there's a rock that is set up perfectly for a jump. This is a great spot to try jumping if you’re just learning. After that I let it rip through some tight s-turns and back down the trail to the bottom, where it comes out into another open red pine forest. After riding this many times in the beginning of the season, riding up All-in is a lot easier than it has ever been for me. I don’t stop after every switchback and I no longer need to walk my bike up some of the trickier and steeper climbs. Surprisingly, and I never thought I would say this, I actually enjoy climbing now because I now have some strong mountain biker calves. There's no shortage of outdoor recreation opportunities in the Whiteface Region. Check out our lodging and dining options and make a weekend out of it!